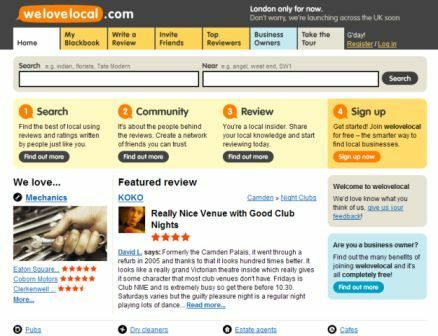 Welovelocal is a recently-launched local listings directory that serves the London area at the moment, but plans to expand the service to the rest of the UK. The concept behind the site is not entirely new, but welovelocal has done a very good job in creating it. It looks good and works very well, with simple navigation. The results are displayed clearly, without some of the clutter that you get with Yell. Photos and links to websites are provided where possible, as well as a list of similar business, which can be useful. Unlike Yell, welovelocal has added a social element, and allows users to review the businesses listed. Businesses can also respond to reviews – they are notified when a review has been left and they can respond to comments. Businesses can also customise their own listings free of charge, adding as much information as they want. In addition, you can connect with other users through the site’s Locals feature. It shows you users who live in your area or have used and reviewed the same bars and restaurants as you. There is also a widget for welovelocal, so you can display your reviews on your Facebook profile page. The site was created by eMomentum, a privately funded internet company based in London. Local listings is a crowded market, and welovelocal will be competing against Yell, which has been improving its website over the last year. However, it has created a very good listings site, and the social network element will give it something different to its competitors. The issue of duplicate content is a thorny one that can affect sites’ search rankings, and one that has even caught Google out in the past. So it’s good that the search giant’s Adam Lasnik has written a post that throws some light on how it deals with the problem.